This motion picture takes a steady, unflinching look at the plight of Jews in Warsaw during the years when Poland was occupied by the Nazis. 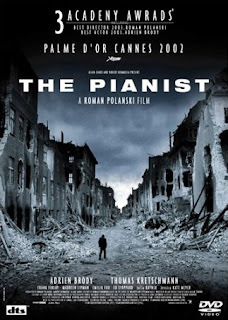 This is not a thriller, and avoids any temptation to crank up suspense or sentiment; it is the pianist's witness to what he saw and what happened to him. That he survived was not a victory when all whom he loved died; Polanski, in talking about his own experiences, has said that the death of his mother in the gas chambers remains so hurtful that only his own death will bring closure. 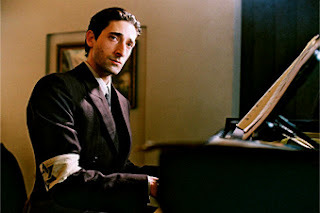 And it's a film whose every moment bristles with the weight of these events on Szpilman's psyche, thanks to a devastating performance by Adrien Brody, an actor naturally adept to characterizing bottomless depth with minimal outward manifestation. Brody is on screen nearly every minute of this two-and-a-half-hour film, and the walking-wounded state of shock he portrays permeates the screen in a way that sneaks into the senses and rattles the soul. His speech has been reduced to grunts, his shaggy hair and gaunt appearance recall images of those dying in the not-so-distant extermination camps, and his goal of survival has devolved into two things: a hunt for food and a flight from predators (the Nazis). The closing scenes of the movie involve Szpilman's confrontation with a German captain named Wilm Hosenfeld (Thomas Kretschmann), who finds his hiding place by accident. Forced to play a rubble-caked piano for the officer, he pours all the energy and life he has left in him into this performance that he's almost certain will be his last. The extent to which Polanski and Brody (who was already skinny but lost a great deal of weight for the later scenes) immersed themselves in this story comes through most completely in this scene. It's clear from the long, single takes -- which include pans from hands to face and back -- that the actor learned not just to play piano, but to play well enough that he could express both immense fear and harmonious grace and splendor all at once in both his acting and his playing. The terrible beauty of this moment is the movie's every emotion in a nutshell, and the astonishing results a testament to the humanity that can be found in the worst circumstances of dread one can imagine.